This list contains some wonderful heart-themed jewelry projects with links to the free tutorials to help you make your own. All of these projects use a wire heart that you can make yourself, but even if you don't want to make your own frame, you'll get some ideas on how to embellish store-bought frames, or you can use the technique on individual links or large links from a store-bought chain. When these projects use thin wire to attach beads, consider trying the same technique using Fireline or a macrame cord like C-Lon, S-Lon or similar thread. The only difference will be that you need to knot the wire to the frame. This dainty little ring has two hearts, which can symbolize the joining together of two people in love. This is a great craft for a beginner wire jig project. If you don't have a wire jig or don't know how to use one, the tutorial only requires standard wire jewelry tools. 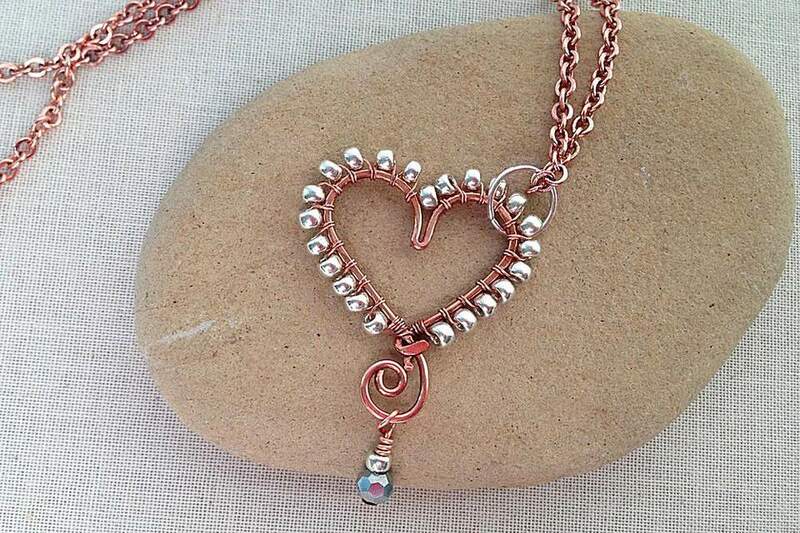 This free tutorial will show you how to make a wire heart that is a perfect necklace pendant or as a base to add beads. This is a beginner jewelry making project, but you will need some basic wire jewelry making tools including wire cutters and round nose pliers. You can use the barrel of a pen or magic marker instead of round nose pliers to make the curves of the heart. This jewelry tutorial will teach you how to make several wire hearts at one time – a great time saver! The best part is that by using this technique, not only will you speed up your jewelry making, all of the wire hearts you make will be the same size and shape. This project will make up to four wire hearts at one time using soft metal wire, such as copper, sterling silver or aluminum. From my personal experience, making multiple wire hearts with harder jewelry wire like brass can be difficult unless you use a thinner wire. This free DIY will also show you how to make a pretty decorative swirl on the wire heart. This link has more DIY jewelry making inspiration to give you ideas on how to decorate a wire heart with beads and wire. This is a perfect jewelry making project to use up some smaller pieces or wire and extra beads in your stash. With a little practice, you can make a swirly wire heart-shaped charm with beads that can be used as a pendant, charm for a bracelet or earrings. Why stop at adding beads on the wire heart, when you can learn how to wire wrap beads to the outside of a wire heart too? This tutorial shows you the technique used to wire the 8/0 seed beads to the outside of a wire heart. You can use this jewelry making technique with any wire frame and any bead that will fit on the shape of the frame. Sometimes it's the simple touches that can make your handmade jewelry stand out from the crowd. The instructions for this wire heart clasp couldn't be easier, but it adds a touch of artisan flair to your handcrafted jewelry creations. 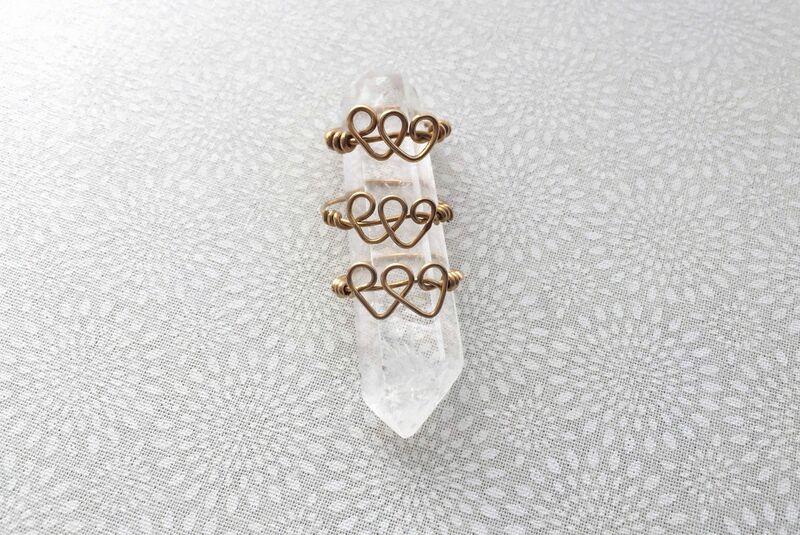 You can use this handmade clasp on necklaces or bracelets, but it will also make a great pair of heart-shaped earrings by adding a bead dangle on the loop. Step by step DIY instructions to make the brick stitch bracelet are available too. Just in case beadweaving is more of your thing, here's a simple wide band beaded heart ring that can be made in an evening. It uses even count peyote stitch, one of the easiest stitches to learn and a great stitch for beginning beaders. Of course, you'll need some basic beadweaving supplies, but then you'll be stitching these fabulous rings to your heart's content.